We appreciate your feedback about your support experience with SomewhereWarm, developers of Composite Products. This helps us maintain high standards on the WooMarketplace, and helps SomewhereWarm improve. Looking for a way to offer customizable product kits, such as custom computers, skateboards, gift-boxes, or made-to-order jewelry? Look no further! Its clean, intuitive interface helps you set up even sophisticated configurators in minutes. Want to offer a custom skateboard? Start by creating its building blocks: A deck, trucks, wheels, bearings and hardware for assembly. Then, populate each with options by choosing products — or categories — from your catalog. Finally, choose a flow and layout that will keep customers engaged — and start selling! Composite Products supports simple & variable products, product bundles and even downloadable/virtual flavors of these product types, giving you an advanced set of tools to make almost anything possible. Love the simplicity of variable products, but need a way to manage the inventory of each option? How about using a multi-page, multi-step layout to spread things out a bit and show more detail? With multiple layouts and option styles to choose from, every Composite product can be quickly adapted to offer a streamlined, personalized purchasing experience. Got thousands of decks, trucks and wheels in your skateshop catalog? 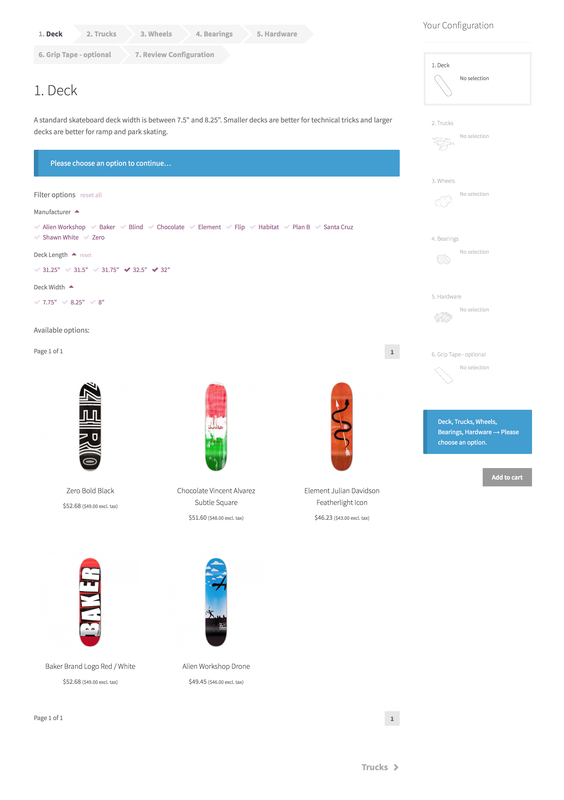 Sure enough, you’ll want to offer them all in the custom skateboard configurator you just built! No problem — choose a paginated, responsive options view to make browsing more fun, and help customers find exactly what they are looking for by enabling product sorting/filtering controls. Composite Products brings advanced conditional logic at your fingertips: Use scenarios to control the visibility of entire configuration steps or individual options. Too many rules to input manually? More variables to account for? Need to trigger custom conditional actions? Its extendable architecture and developer-friendly documentation have established Composite Products as a great starting point for any demanding kit-building project. Almost there, but not quite? Check out our growing collection of snippets and mini-extensions for some of the most commonly-requested customizations! Out of luck? Not yet! Composite Products includes an impressive arsenal of action and filter hooks for customizing every detail of its behavior. Looking for REST API support? We got your back there, as well! Is Composite Products right for you? Composite Products is suitable for creating advanced product kits that consist of multiple components with several product options. If you want to create simple product packages with static content, Product Bundles might be a better option. 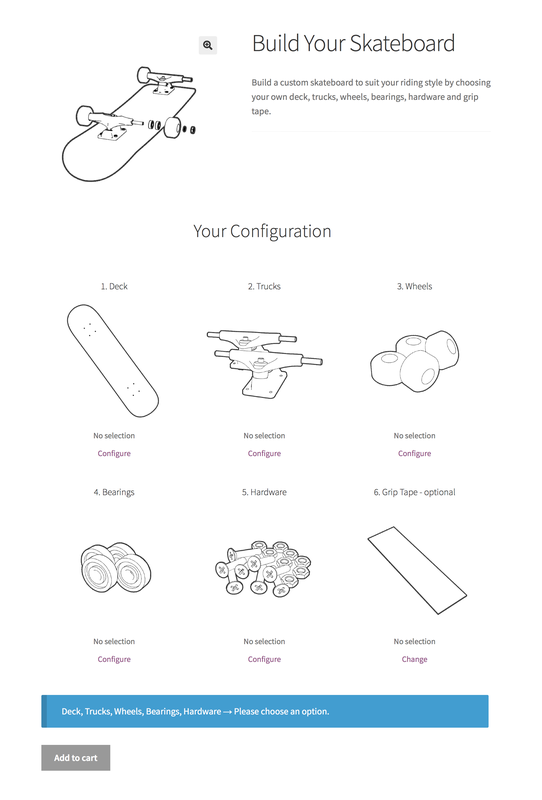 Note that Product Bundles can be nested in components to build even more complex configurators. 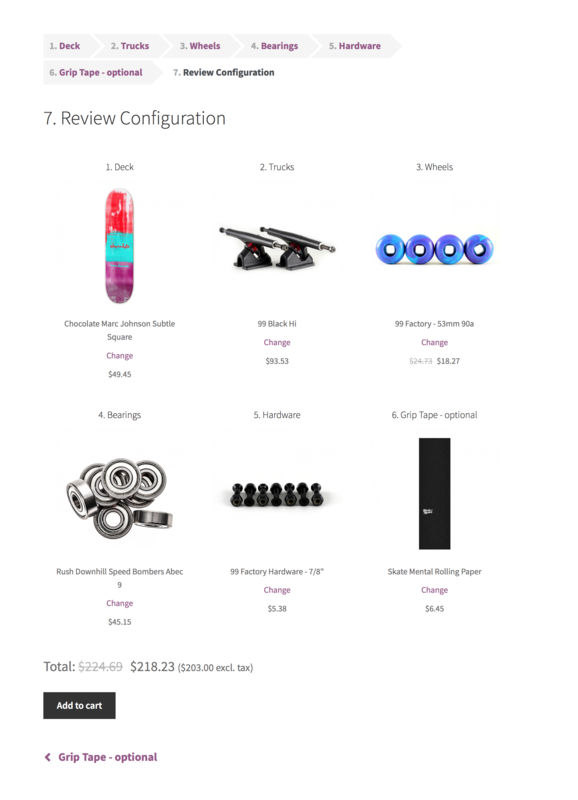 WooCommerce provides even more ways to sell products in kits, such as Grouped Products, Chained Products and Force Sells. Can’t figure out which extension is right for your store? We’ve written a handy comparison to help you decide. Great product, even greater Support! We wanted to make a customization with the Cart view of the composite products, but didn't know how. Within a few hours support sent us a snippet for free and everthing worked immediately just like we wanted it to work. It is a great product and get supported by an excellent team. I had a little issue after the last upgrade and good fast help and it was solved very soon. Even in this case I forgot to set a price, which generated the issue. Not allowing to add elements which are not complete, like missing sales price. Fantastic plugin! Support corrected any bug I found immediately. It just does what it's supposed to do. This might be a bit overwhelming at first (since there's no "best way to do it", just a bunch of powerful options you have to play around with a bit), but once you figure out how the whole shebang works, it's a breeze. The support was stellar, too. Helped me out with customization and it seemed that they really wanted to help and not just to get rid of me ;) Also: Awesome developer documentation/options (makes use of hooks/filters a lot and uses the WooCommerce template system, which allows you to override the default files with custom ones inside your theme folder). Adding a lot of products just for one final composite product can be a bit impractical and might clutter you product list after a while. So it would be great to maybe add a custom post type for that. Maybe add a couple of templates/styling options for the different composite layouts for less experienced webmasters (if you’re familiar with CSS styling shouldn’t be a problem). It helps let customers build their own packages from components that you set. Rather than making every package yourself, you give your customers the opportunity to build the packages according to their needs. Should have the option to add design costs if adding certain components increases the labour for us. Sometimes you have to pay different amounts based on what components you ask the workers to assemble. Currently, you can only build this funcitonality into your components plugin via scenarios which takes a long time and strenuous effort if you have lots of products/components. Great product to easily extend products in your woocommerce store so much further. Amazing support from the development team who are always quick to answer and eager to help wherever possible. We've been provided with numerous snippets of code to customize our use of this product further which has been truely amazing. Enable easier integration & compatibility with other (third party) products such as wishlists, quotations, etc to further extend woocommerce when using Composite Product types. There still seems to be a real lack of compatible products around. I have found hardly anything you can't do with this product. It's super flexible and fairly easy to customize as needed. Also, whenever I had any issues, I reached out to support, and they got back to me within 24 hours with super helpful responses. It would be great to add info icons all over the place (it’s already in some areas), including a link to the area in the documentation that elaborates on that specific part. It is so easy to use it, and with any option that I needed. Composite product made a big difference in my webshop and the support is excellent! At the moment I can not think of anything =) It is good as it is. Very powerful if you need to configure complicated products. Excellent customer service as well. It is stable, has some awesome features, is very versatile and has a great support. Possibility to add / see the product gallery for the selected composite. It is an incredible product. Very complex and powerful functionality that was implemented in a way that makes things comparatively easy for admin users. Lots of options that will let you create different kind of configurators and meet your specific needs. We got superb support from Manos and his team, that has answered to each and every question we've sent them, and they even have given us suggestions and examples about how to customize their plugin further, which would normally be out of the support agreement! I’d like to see more options in the dashboard pages to customize layouts within the summary widget, or the components options, like disabling pagination for options, hiding the selected component option title, price and thumbnail, changing the location of the add to cart button, etc. without having to do it through priority changes for the actions, or css customizations. I have been using this plugin for more than 2 years and never had any issues during that time. Recently during a WordPress update I came upon an issue related to my website setup that SomewhereWarm graciously solved for me. Very helpful and highly recommended product. Good plugin with good support! A key function that I needed for our store was provided with this plugin and the support has been excellent in terms of responsiveness and solutions. Thank you! 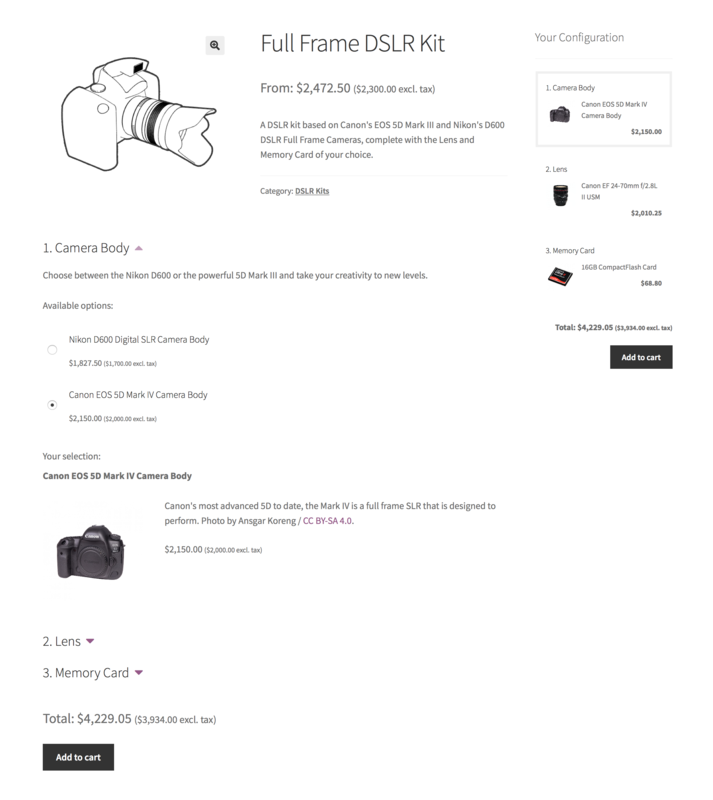 Fantastic plugin for making a complicated composite product in woocommerce, and really helpful support when I need some extra functions and help, also provided a customised add-on to suit my requirements. Highly recommended. The support which comes with this plugin is a great example of the WordPress ecosystem of paid plugins generally being good investments. The plugin’s features are very useful and their support saved me hours of work by answering my question fully (with a code snippet!) rather than just signposting me in the right direction. I love the configurability of this plugin as it's allowed me to create a fairly complex (for me at least!) package of parts that customers can configure and buy on our website. I had one issue getting this to work exactly how I wanted with the Product Bundles plugin from the same publisher - I contacted the publisher and they were very responsive and they were able to help me resolve my issue. So I am very satisfied with this plugin overall, thank you! I think this is great for 99% of the cases, but in my case I needed to add a bit of custom code, so getting rid of the custom code by adding more options in the plugin would be nice. This plugin is a tiny bit complicated to use because there are so many options but it works perfectly once you get the hang of it. I needed support for a problem I was having and support came through very quickly. I will use this plugin again on future projects! Excellent flexibility and powerful filtering options make this a great guided shopping experience for WooCommerce. Built-in support for WooCommerce Subscriptions would be wonderful. This plugin isn't for the faint hearted, but don't let that put you off because the support is superb. If you have a complex custom configuration product, then this is powerful enough to do you want if you're prepared to get your head around the logic. Once the penny drops, you'll get it! I’d say more comprehensive documentation would help, but I’m not sure it would be possible to realistically expand this as there are so many possibilities which could not be covered. This is where the great support comes in because every solution will likely be bespoke to the individual’s requirement. This extension has been a life saver for my WooCommerce site. Some of my products can have as many as 13 configurable options, and just using dropdown menus wasn’t going to cut it. Additionally when I reached out to the developer with some problems I had while customizing the plugin for my theme, they were extremely helpful. Great customer service. Simple to use and great support when I got stuck. It would be nice if there were some more options for layouts. Super customizable, and the support is amazing. The documentation is good, but because the plugin does so much, it's helpful to be able to ask specific questions and get fast and detailed responses. I have had very good success with it! I am being asked how it can be improved, and I have no suggestions. We've been using it for over two year on two sites. For our use case (bundles of multiple variable and single products, some optional) it has cost us too much time to enter and maintain the shop. In the end we decided to simply stop offering bundles of variable products and are now using Elementor + ACF Pro to handle things. The low score is party for the user interface, mostly because of a bug where both Woo and this plugin could not find a solution for. On the bright side, their support is very responsive and attentive! For that the get an extra star. I do really wish they would start over, especially with the UI. See comment below. Start from scratch, look at real-world use cases and the people who use them. Re-think the UX/UI. Lower the price. We found a better alternative at a lower price. A great solution to customize products according my needs, excellent support from Jason for installation and configuration. Nothing in mind at the moment.